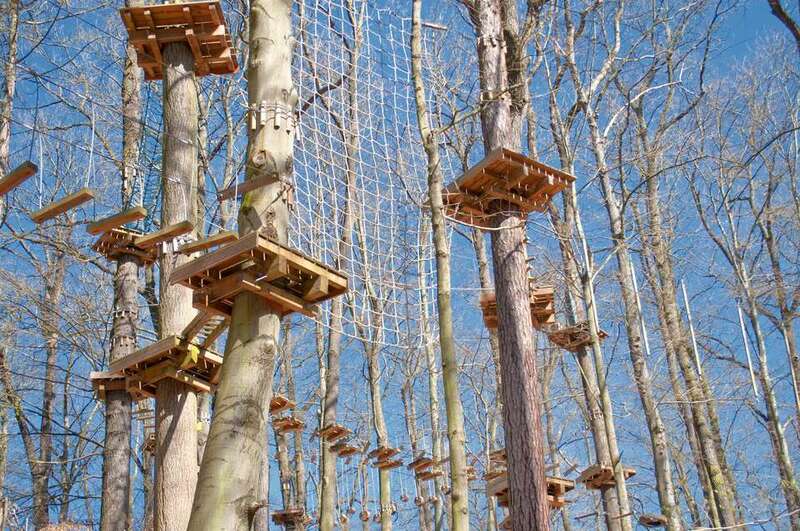 Unleash your inner Tarzan in Pittsburgh's North Park at the seven-acre Go Ape! Treetop Adventure Course. Thirty-seven obstacles situated in the treetops of North Park include five zip lines and two Tarzan swings, plus ropes, bridges, ladders, swings, and trapezes. Obstacles unique to Go Ape's North Park course that doesn't appear in their other USA courses include the Pirate Crossing and Chantemerle Bridge. Go Ape is a highly interactive treetop adventure where participants are equipped with harnesses, pulleys, and carabineers and training before they are turned loose into the forest canopy to enjoy an exhilarating adventure through the treetops. The course allows you to move at your own pace, but can generally be completed in two to three hours. It caters to all skill levels with bypass routes offered for many challenging obstacles. Zip lines #3 and #4 are both well over 400 feet and the entire course consists of over 1,400 feet worth of zip lines! Expect to get quite a bit of exercise. You'll also need to leave any fear of heights behind - obstacles range from 35 to 50 feet above the forest floor! The course obstacles progress from easier to more-challenging, allowing time to build up both skills and confidence. Non-participants are welcome to watch from a variety of vantage points along the trails below the treetops course. Hours of operation for the Go Ape! Treetop Adventure Course can vary depending on the time of year and daylight hours, so please check in advance of your visit. Hours vary according to daylight hours, but some parts of the course may be open as early as 8:00 a.m. during the summer. Book your reservation online to see exact hours the course is open on a particular day. Maximum Weight: 285 pounds. If you are under but close to this weight, there may be a possibility that the harness will not fit properly and you will still be unable to participate. You are welcome to visit the cabin in advance of your visit to try on a harness if you have concerns. Supervision Ratio: One adult (18+) may supervise either two 10–15 year-olds, or up to five 16–17-year-olds. Supervising adults have to be on the course with the children and may not supervise from the ground. Go Ape! Treetop Adventure is located just minutes from downtown Pittsburgh in North Park. North Park, located within McCandless, Hampton, and Pine Townships, is the largest and one of the most scenic of Allegheny County’s nine parks. Within the park, the ropes course is located between Pearce Mill Road and the tennis courts to the east of the boathouse.